Being vegan and dining out is a fear free experience for me, and I believe that every single vegan should be able to say the same thing. It just takes a little bit of education, a whole lot of confidence, and a thick skin. I’ve made it my mission for the last 5 years to help other vegans feel as comfortable as I do when I go out to eat. I have been veg*n for over 22 years; I give my food no more thought than any of my omnivorous friends and family. It’s my business what I eat, and like everyone else in this world, does not appreciate attention being brought onto me while out to enjoy a meal at a restaurant. Being vegan is not a food allergy or a handicap, it’s a lifestyle choice that I have made for myself and it is my responsibility to attend to that decision. Scanning through vegan websites, there are always new converts, or potential converts, who are delaying their progression to vegan because they don’t believe they can ever again eat out at a restaurant with their friends and family. Not so! I rarely eat at “vegan” establishments, and have discovered that most “mainstream” restaurants are not only accommodating to my needs, but enthusiastic about customer service. Only good things have come from my vegan dining adventures, that includes emails from managers whose restaurants fell short promising me that if I return they will fix the issues. Unfortunately, though there is always a vegan or vegetarian option at every restaurant, it is not a wise choice to just walk in the door completely unprepared. Over the years, I have devised my pre-dining methodology and spent the last 5 years blogging about how I make it happen. My hope is that just one person will see that dining out in a mainstream restaurant isn’t scary, it can actually be stress-free! I’m going to discuss the steps you can take to say “Yes!” to any restaurant suggestion that comes your way. You should be able to find out everything you need to know about a new (to you) restaurant within 10-15 minutes of a spontaneous suggestion. So, it’s important to utilize the internet before any outing. We all have our “safe places” we enjoy dining. Believe it or not, you probably have a list of 3 places you’re confident when dining. What makes those places your favorite: do they have several veg*n items on the menu already? Do you like a particular server? Is it well reviewed on Yelp? Whatever the reasons, keep those in mind when branching out to a new place. Do you know other vegetarians and vegans in your area? Great! If you have time, ask them if they’ve ever been to the particular place you’re planning to go to. Get their honest opinions and any information you can get about things like lactose & “meat” intolerance issues after the meal, especially if you suffer from either of these things. Cross contamination is something that is not only an ethical issue, but a physical concern as well. How did the servers treat them? How interesting was the meal they received? Was it a pile of steamed veggies on top of soggy pasta with olive oil or was it something more creative like stuffed artichoke or portabello “steaks”? It’s important for managers, chefs and servers to understand that customer service is top of the list when it comes to dealing with special dietary needs be it allergies or ethical choices. Check out the restaurant’s website, with particular attention to the menu. As you get better at reading menus from a veg*n slant, this takes less and less time. But in the beginning, you may want to have a notepad handy to keep track of your choices and take notes on your experiences. First, look for vegetarian items already listed on the menu. Can they easily be made vegan? If so, then you’re all set. Make a note and order it when you arrive. If not, then this is where you need to get a little creative. Continue to scan the menu to see what sorts of items are being made. Do you see a risotto? Nevermind that it’s made with lamb, just file the risotto. There usually are various pasta dishes and salads, but take note of the clearly vegetarian ingredients being used. 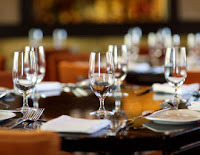 When you arrive at the restaurant, you will then have an idea of the options you can discuss with the server, if they don’t make their own suggestions. Second, if you didn’t have a chance to look at the menu on line, never fear. You’ll find it harder to keep up with conversations while you read the menu with the same critical eye discussed in the previous paragraph. I always choose one vegetarian option that I will then tell the server I am vegan and ask if it’s possible to leave off the dairy. This conversation starter will give you a clear idea of whether they are experienced with vegans (or vegetarians) and how you will handle your own meal from that point on. Armed with your list of items from the online menu, you may consider calling ahead if possible. You may want to suggest to your party that you make the reservation, this gives you a chance to speak to the hostess and possibly a manager ahead of time and off the radar of your friends. Ask clear and polite questions regarding the possibilities on the menu. More times than not, calling ahead has resulted in an offering of something “off menu” which I am “guaranteed” to enjoy. I never ever refuse an off menu item. Ever. It’s called “Culinary Arts” for a reason, I respect their artistry and professionalism, and have always loved the creations I am given. In the off chance that the phone call feels unproductive, remain polite but be sure that the hostess makes a “note” that there is a vegan in the party. Once at your table, you can deal with a server or worst case scenario, with a manager. This is extremely rare, but know the chain of command in the dining room so that you don’t feel cornered or marginalized. I often begin any dining experience with the words, “I’m vegan, so if there’s anything you can suggest for me…” and wonderful things happen. Restaurants are businesses, and customer satisfaction is important to their success, so 99% of the time managers and chefs will bend over backward to make sure that you are happy – whatever your dietary needs. That doesn’t mean that a server, the tired and underpaid worker, has any interest in your satisfaction. I have had to deal with impatient servers who could care less, and that worries me. Whenever I feel that my server isn’t taking my needs seriously, I ask to see a manager. They quickly step up their game. You may have to remind them that you do not eat any fish, either. Sometimes servers don’t equate fish with veg*nism, so especially in Asian inspired dishes you may want to ask what is in the sauces. One last thing I do before the server finishes my order is to say something like “did I remember to ask for no cheese on that?” I’m sure they can see through my intent, but I don’t care. It’s a much more polite way to approach the situation and ensure that I’m not going to accidentally get something I don’t want to eat. The vegan community is a talkative one, and reviews of restaurants spread fast. Managers and chefs know this and they will do anything they can to prevent a negative word from getting out. As I said before, I’ve received messages from managers inviting me back for another meal so that they can have a second chance to present a better dining experience. Most owners, chefs and managers are quick to respond, so fire off an email or fill out the comment “card” on their website within 24 hours of your visit. Stand by your words, offer your personal email address and use your full name. Don’t write something if you don’t intend to stand behind it – even if that means lodging a complaint. Be polite, gracious and friendly no matter your comments. Sometimes, a restaurant is just not used to dealing with a vegan, so offer a couple of suggestions on how they could make the experience better for others who follow. Kindness and compassion are at the heart of veg*nism. We are ambassadors for veg*nism whether or not we like it. Try to remember that you’re not the first nor the last vegan to visit their restaurant, so set an example and blaze a trail for the others to come. If we can change the attitudes of vegans who want to dine out, then we’re on the right path. Dining out isn’t scary: it’s an adventure!